Typically bank and credit union executives mention a lack of talent, lack of funding, poor infrastructure, or even lack of data as being barriers to digital effectiveness. And those are significant factors. 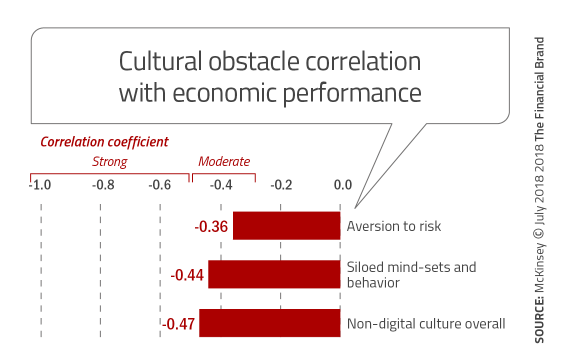 But three cultural barriers surpassed all others according to research by McKinsey & Company. These were: 1. the presence of functional and departmental silos, 2. a fear of taking risks, and 3. the difficulty of forming and acting on a single view of the consumer. “Getting culture right is the key to success in a digital world and resolving culture issues is ‘no longer optional’,” states the study. It’s so important, in fact, that McKinsey recommends that banks and credit unions bring in leaders willing to shake things up. When silos exist within financial institution, says McKinsey, it is impossible to get a true 360 degree view of the consumer, resulting in both slow and incomplete responses to needs. The cultural issue of risk aversion usually results in an under investment in strategic opportunities and slow responses to consumer needs as well. Finally, when a single view of the consumer is not developed, organizations fail to recognize the consumer journey and integrated touchpoints, and have trouble creating consistent experiences. All of these challenges hinder optimal digital strategies. In McKinsey’s view, waiting for an banking company’s culture to change organically is not a fast enough process in the digital age. In other words, it is difficult to teach an old dog new tricks. One primary reason is because leadership already in place may be part of the foundation of the existing culture. Executives must be brought in who will be proactive in developing a new customer within the institution. This new leadership must be willing to embrace the change that is occurring in the market, be willing to take risks and, most importantly, be willing to disrupt the existing organizational culture. Bottom line, the effort made to make a cultural transformation must equal or exceed that which is being done to achieve operational transformations. “Executives must be proactive in shaping and measuring culture, approaching it with the same rigor and discipline with which they tackle operational transformations,” says the McKinsey report. As mentioned, the focus of this cultural transformation must be on eliminating silos, accepting more risks, and focusing more acutely on the consumer experience. McKinsey found that not making these required cultural changes can actually have a negative impact on financial performance. “Our research, shows that cultural obstacles correlate clearly with negative economic performance,” the authors say. When people discuss silos in banking, most think in terms of an organizational chart. While this illustrates the division of responsibilities within an financial institution, that view is far too simplistic. A much larger dynamic lies beneath the surface, where the inability to share insight about customers across silos makes the process of seamless digital transformation all but impossible. In a digital world, the power comes to those banks and credit unions that realize the potential of working cross-functionally and of driving customer centricity into the everyday operations of the business. “The narrow, parochial mentality of workers who hesitate to share information or collaborate across functions and departments can be corrosive to organizational culture,” states the report. In fact, executives surveyed in the report ranked siloed thinking and behavior as the most damaging among obstacles to a healthy digital culture. Sharing data and insights and encouraging transparency across the institution helps to create a consistent direction and digital culture. Another way to achieve better alignment on a banking company’s direction is to rotate executives between siloed functions and business units..
Internal accountability helps solve the siloed culture problem of regarding an issue as ‘someone else’s responsibility.’ To achieve this, organizations must remove the barriers that keep people from collaborating, and build ways to eliminate the bureaucracy that legacy cultures (and management) have built up over time. Accepting risk goes far deeper than encouraging experimentation and the acceptance of failure — broad concepts that are still foreign to many legacy banking executives. In fact, many banking leaders started their career with the desire to be in a lower risk environment. Beyond the personal aspect of accepting risks, capital markets have typically rewarded organizations that were more risk averse, making a change in culture that much more difficult. Nowhere is the importance of top leadership commitment more important than on the perspective of risk-taking. While outside hires and start-up partnerships may help, top management must also empower frontline employees to make decisions based on new insights that accept small-scale risks. “The critical question for executives concerned with their organization’s risk appetite is whether they are trusting their employees, at all levels, to make big enough bets without subjecting them to red tape,” says McKinsey. At the same time, executives must be willing to make bold, decisive actions that enable the business to pivot rapidly, sometimes at very large scale. In banking, the pace of change has never been faster…leadership decisioning must reflect this new norm. Despite making ‘Improving the customer experience’ a top of goal for several years, most financial institutions are falling further behind in this objective, especially as digital consumers become more demanding. This is a double-edged sword, with digital technologies providing greater capabilities to personalize experiences at the same time that consumers are asking financial institutions to customize solutions more than ever. Bottom line, having a customer-centric culture is more than just a good thing — it’s become a matter of survival. “Although companies have long declared their intention to get close to their customers, the digital age is forcing them to actually do it, as well as providing them with better means to do so, the authors said. Done well, customer-centric cultures anticipate emerging changes in consumer behavior and customize relevant interactions by integrating structured data with unstructured data for a better consumer journey. In talking to financial institutions of all sizes around the world and in doing the research for the Digital Banking Report, it is clear that culture is one of the biggest differentiators between successful and less successful organizations. While it is understandable that cultural change may be slower than technological change, a proactive focus on changing culture is still an imperative. Change is going to continue…albeit at a faster pace than we have ever experienced. Rather than reacting to this change, it must be embraced and dealt with both strategically and organizationally. Speed and agility is part of this process. An organization’s perspective on risk must also change. Greater risks don’t necessarily need to be taken, but the use of data and analytics must be leveraged to provide a better perspective on the risks that are financially viable. Being a fast follower is no longer a valid strategy. Finally, organizations must be willing to disrupt the status quo. Slow, incremental adjustments to last year’s strategy aren’t enough. The consumer expects more from their financial institution because they get more from other business partnerships like Amazon, Google, and Apple. Disruption will also need to occur on a personal level, since the marketplace is demanding skills that are beyond what most executives and employees have been taught. As stated by McKinsey, it is more important than ever to build organizational cultures that perform well across functions and business units, embrace risk, and focus obsessively on consumers.